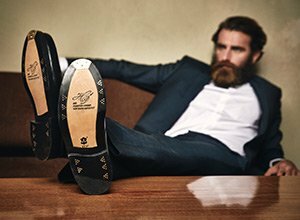 Quality, simple dark brown shoe care—the 6-piece dark brown shoe polish set. 5-piece exotic shoe polish kit—gentle care for your exotic leather shoes. Emulsion for a great protective care and colour refreshing. Quality, simple black shoe care—the 6-piece black shoe polish set. Fluid cleaner for rough leathers such as suede, nubuck and velours. Goodyear-welted shell cordovan penny loafer in burgundy.